Last spring I whipped up an avocado cream sauce to accompany some spicy grilled fish tacos. It was good, but today I added a few twists that made it even better. As the name implies, this can be used as a sauce and/or dip. 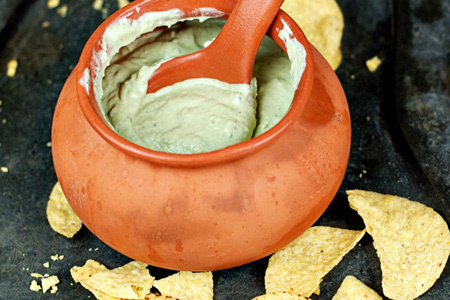 It's thick, cool and creamy, almost like a saucy guacamole. I've added two kinds of roasted chiles and roasted tomatillos to give it added depth of flavor. Core and quarter the tomatillos. Quarter the jalepeno lengthwise, remove the seeds, and slice out the membranes. Note: Leave the membranes if you like the added spiciness, or use hotter canned chiles. Toss the tomatillos and jalepeno with the canola oil and kosher salt in a small bowl to coat, then pour them on a sheet pan. Roast the tomatillos and jalepeno in the oven for 20 minutes, then remove and let cool. Mash the avocado on a cutting board with the side of your knife and put them in a medium mixing bowl. Add the lime juice, green chiles, sour cream, and garlic salt to the bowl. Dice the cooled tomatillos and jalepeno, add them to the bowl, and stir to combine. Blend all of the ingredients with a stick blender until smooth. Note: You can certainly use a food processor or blender. This dip sounds and looks so cool! I am really going to try this. Thanks. This reminds me of a fantastic sauce that is served with my favorite fish tacos from a restaurant in Houston. I now live back in Boston (where I'm originally from) and though I love it up north, good tex-mex is tough to come by here. I can't wait to make this sauce/dip! I'm sure it tastes as good as it looks :). I'll be making this soon, sounds great I never thought of adding tomatillos. One tip when working with avocados is to always use plastic utensils and bowls, no metal. It will help to keep your avocados and avocado dishes from turning brown. I slice and freeze avocados when they are in season using that tip and don't have to use citric acid to keep them from browning. I made this as a sauce for mahi mahi tacos, and it was excellent! Thanks for a great recipe that I'm sure I will be making time and time again :). Looks delicious! I've never cooked with tomatillos before though so that will be a new adventure. I definitely will keep this one in mind next time we have a party! Just made this tonight, excellent dip. And made for an excellent appetizer for your tri tip recipe. Thanks for sharing all the recipes. I am enjoying making my way through them. Thanks Billy, I'm glad that you enjoyed it. It is a nice cool summer dip.